Sign-up details, performance guidelines, and more, here. 12pm till you or the sun drops! South Bay Folks celebrates 26 years of music-making and acoustic camaraderie. More info here, and a printable flyer here. The Vasona Vibrations Acoustic Open Mike returns this year, and is open to all acoustic musicians, singers and songwriters. Lawn seating; pack a picnic and bring a blanket or low lawn chair. Non-perishable food and cash donations gratefully accepted for Second Harvest Food Bank. Find the event flyer here, and more info on Vasona Vibrations here. For the 16th consecutive year, Santa Clara County Parks and South Bay Folks team up to bring you free, family-friendly, concerts in support of Second Harvest Food Bank. The series features local artists performing a wide variety of acoustic genres from Americana to zydeco. Bring a blanket or low lawn chair. More info and a complete schedule is posted here. Great fun and acoustic camaraderie! More info here, and a printable flyer here. 12pm 'til you or the sun drops! South Bay Folks celebrates 25 years of music-making and acoustic camaraderie. More info here, and a printable flyer here. A new event has been added to the Vasona Vibrations Concert Series: An acoustic open mike held on the Vasona Vibrations stage. Open to all acoustic musicians, singers, and songwriters. Pack a picnic and bring a blanket or low lawn chair. Limited seating available for seniors and disabled. All Vasona Vibrations concerts are free. Non-perishable food and cash donations to support Second Harvest Food Bank gratefully accepted. Sign up by 3:45pm. Please see the event flyer, and the event's Facebook page for more info on signups and performance guidelines. The open mike will generally follow the sign up procedures and performance guidelines as for a South Bay Folks open mike. For the 15th consecutive year, Santa Clara County Parks and South Bay Folks team up to bring you free, family-friendly, concerts in support of Second Harvest Food Bank. The series features local artists performing a wide variety of acoustic genres from Americana to zydeco. Bring a blanket or low lawn chair. SBF Open Mikes at Los Gatos Lodge have been cancelled. Please see the SBF Open Mike page for more info. South Bay Folks celebrates its 24th Anniversary with a picnic and acoustic jam on Sunday, October 9th at Vasona Lake County Park in Los Gatos. Great fun and acoustic camaraderie! More info here, and a printable flyer here. For the 14th consecutive year, Santa Clara County Parks and South Bay Folks team up to bring you free, family-friendly, concerts in support of Second Harvest Food Bank. The series features local artists performing a wide variety of acoustic genres from Americana to zydeco. Bring a blanket or low lawn chair. Noon 'til you or the sun drops! Spring has sprung, and there are songs to be sung! The SBF Spring Picnic Jam is Sunday, May 15th at Vasona Lake County Park in Los Gatos. Great acoustic fun and camaraderie. More info and a flyer here. No open mike on Thanksgiving, Christmas Eve or New Year's Eve! Please take note: There is no SBF open mike on Thanksgiving, Christmas Eve, or New Year's Eve, which all fall on a Thursday ths year. Otherwise, the South Bay Folks' Acoustic Open Mike continues every Thursday, 7-10pm at the Los Gatos Lodge, in Los Gatos. The South Bay Folks Acoustic Open Mike returns! South Bay Folks' Acoustic Open Mike returns for a trial run at the Los Gatos Lodge, beginning 7-10pm, Thursday, November 5th, in Los Gatos. Village Falafel is out of business, and at this point we don't expect it to reopen. Many thanks to Varouj, his family, and all of Village Falafel staff for over three years of support, hospitality, and great food. We are currently looking for a new venue. Until then, the South Bay Folks Acoustic Open Mike is on hiatus. We will post here and to the SBF email list when we have found a new host for our community. Stay tuned. No open mike on Thursday, October 22nd. Note that there is no open mike on Thursday, October 22. Village Falafel will be closed that day. 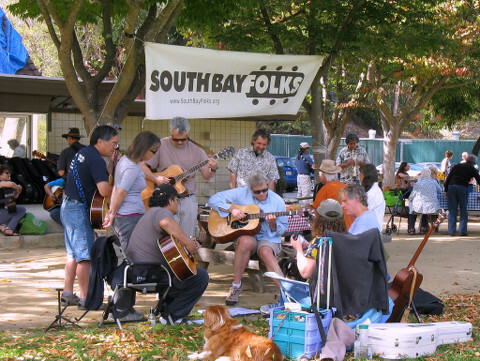 South Bay Folks celebrates its 23rd Anniversary with a picnic and acoustic jam on Sunday, October 11th at Vasona Lake County Park in Los Gatos. Great acoustic fun and camaraderie. More info here, and a printable flyer here. For the 13th consecutive year, Santa Clara County Parks and South Bay Folks team up to bring you free, family-friendly, concerts in support of Second Harvest Food Bank. The series features local artists performing a wide variety of acoustic genres that runs the gamut from Americana to zydeco. The SBF Spring Picnic Jam is Sunday, May 17th at Vasona Lake County Park in Los Gatos. Great acoustic fun and camaraderie. More info and a flyer here. South Bay Folks celebrates its 22nd Anniversary with a picnic and acoustic jam on Sunday, October 5th at Vasona Lake County Park in Los Gatos. Great acoustic fun and camaraderie. More info here, and a printable flyer here. For the 12th consecutive year, Santa Clara County Parks and South Bay Folks team up to bring you free, family-friendly, concerts in support of Second Harvest Food Bank. The series features local artists performing a wide variety of acoustic genres that runs the gamut from Americana to zydeco. South Bay Folks (SBF) is a grassroots community of musicians, singers, and songwriters that sprouted from a folk oriented, all acoustic open mike to provide an opportunity for performance, collaboration and musical development. 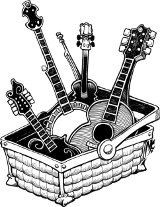 Since 1992, SBF members have volunteered their effort, time, and talents to foster a rich and robust acoustic music scene in the greater San Jose, California area. Today, SBF continues to host its free acoustic open mike which encompasses a wide variety of acoustic genres; keeps a calendar of live, local, acoustic music performances; and maintains a mailing list to keep track of SBF activities and events. Since 2003, SBF volunteers have worked with Santa Clara County Parks to bring live folk and acoustic music to a wider audience with events such as the free Vasona Vibrations Summer Concert Series at Vasona Lake County Park.